Rock Me! Summer of Love is the easy, free-spirited fragrance I've always wanted to create! Everyone knows, I'm totally influenced by rock music. Of course there are very different types of rock — and I love them all! This scent is for the rocker girl who has a softer indie-folk side. [...] Wear "Rock Me! Summer of Love" during the day...then switch to the original "Rock Me!" for a night out on the town...they both complement each other! Rock Me! Summer of Love is a watery floral, and features notes of bergamot, blue water hyssop, geranium, peach, freesia, waterlily accord, musky rose, sandalwood and ambergris. The fragrance does not sound particularly exciting, either. She does seem to always be doing that ‘Blue Steel’ look, ne? Sadly, I think most everyone falls into this habit. I have a few model friends who make the same face in every single picture they have taken of themselves, professionally or candidly. That said, the ad is all kinds of awful. Even if I was part of the target market for a fragrance like this I’d find it terrible. The notes of geranium, peach & freesia don’t sound very appealing to me this morning. K, I have no model friends to compare to, lol. I have been reading your LJ and being jealous of your exciting life of cons! Anyway, all I know is that this chick is the darling of the modeling world, and I DON’T KNOW WHY. Robin, I’m afraid it probably wasn’t the styling… she really just always looks like this! Lol. My exciting life of cons? I’ll admit I’ve been stalking your perfume blog & your entries are some of the most entertaining I’ve read especially your disdain for that really awful movie with crystal skulls & aliens that I won’t dignify with a name. I really don’t get some of the models out there today. Every now and then you get this really strikingly beautiful one, but Agyness is terrible. I long for the days of flipping through my mum’s Victoria Secret catalogs and seeing the likes of Latetia Casta & Stephanie Seymour. Perhaps if they actually made it appear like she was supposed to be doll-like I could understand the blank stare, but I don’t find her appearance to convey that at all. Thank you so much for reading!!!! I am delighted to hear it I have yet to find a single person in our lovely DC area who will listen to me talk about perfume for more than 30 seconds, so keeping a perfume blog has been very good for me. Which reminds me, ready for the snow this weekend??? Luckily one of my closest friends & I both have something of an affinity for perfume. A few days before Christmas she and I sat around going through her perfume collection. We have different preferences as far as perfume goes — I an oriental girl myself, whereas she likes white florals — but they suit our personalities well. If not for her, I dunno who I’d be able to discuss my love with. And no, no I am not. I heard that the Fairfax area was potentially getting up to 2 feet of snow. These winter shenanigans need to stop. I’ll be spending the weekend in MD with aforementioned friend I just hope I don’t get stranded there. Yeah, I kind of like my models looking like women. And Shiraz Tal is gorgeous. Such a lovely, natural yet exotic look. The modeling world needs more like her. I assumed she was meant to look like a doll here? But maybe not. 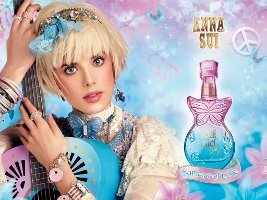 All the Anna Sui perfume ads I can think of have that doll theme going on. With the exception of maybe the Love ad, she chooses models that look or look in the ad deliberately so. That’s what I assumed too. Ari = best post ever! Agyness makes me throw up a little in my mouth. Oh my – the packaging and bottle look like this should be sold at the dollar store as a stocking stuffer for 8-year-old girls. Not that cheap, but it is geared quite young. I normally try not to comment on the ads, but good god, that is one of the blankest stares I have ever seen. Yes! It’s perfect. If that’s what they were after. Good look at Charles Bronson in Mandom, you’ll feel better. Drugs maybe? Lobotomy? What’s wrong with that girl? But “watery floral”…at least they’re honest. I really like Agyness Deyn, but I must agree with you here. This ad isn’t even over the top in a cute way…just gaudy and weird. Ditto that. I think she’s adorable (although I’m not loving what she’s doing with her hair these days), but the ad is icky. It reminds me of something from a teen magazine I would have read in the 80’s. Another Anna Sui flanker so fast.The only two Anna Sui fragrances I really like is original Anna Sui and Sui Dreams.I really wish it were easier to for the original.That was a great fragrance.This one looks like its too young for me. Guessing that means Rock Me! sold well in Asia. The only watery floral I owned and loved to the point of obsession was Shiseido Relaxing. It was probably more green than floral, but left some very huge and beautifully scented shoes to fill. This sounds really uninteresting. But I’m sure it will smell good enough to sell well. I suppose wearing some Ormonde Jayne today doesn’t exactly level the intrigue playing field for frags like this one.